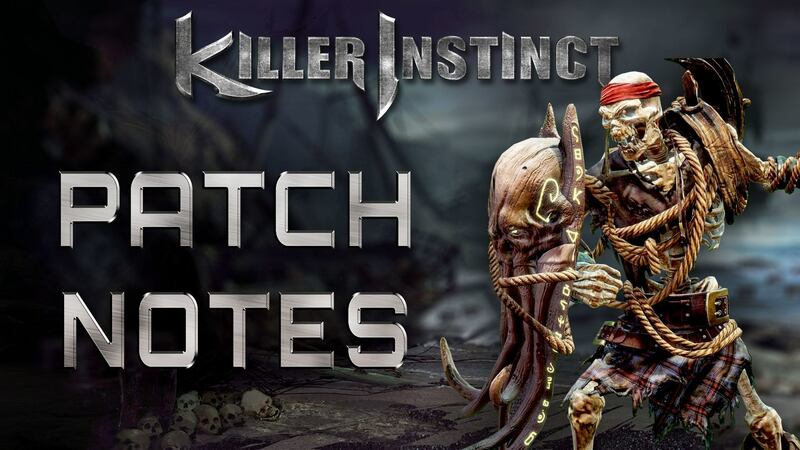 The KI Team just showed all of the rebalance changes coming to Season 3 at the KI World Cup! Be sure to tune into the event happening all weekend on http://www.twitch.tv/maximilian_dood. [*] Some characters now have attacks that inflict a new “Stagger” reaction on the opponent. Opponents are vulnerable to throws during Stagger, just like after a Wall Splat, and cannot escape early in any way. You can still tech throws here so long as you are not locked out, just like a Wall Splat. [*] Some characters now have attacks that can cause a new “Flip Out” reaction against airborne opponents. Instead of putting them into a juggle state, they flip and land on their feet, allowing you a surprise mixup opportunity. [*] If you do not hit your opponent with anything breakable during your combo at any point, your Ender will not cash out and will be breakable. [*] Opener->Ender now remove lockouts, so that Opener->Ender is always breakable. [*] Ground Combo Breakers cause Flipout and are between -1 and +2 (Previously they caused soft knockdown and were between +30 and +60). This also makes it impossible in all cases to combo off of a Ground Combo Breaker. [*] Air Combo Breakers now cause Blowout. This makes it impossible in all cases to combo off of an Air Combo Breaker. [*] You can no longer cancel into Instinct from a Combo Breaker. [*] Hits that blow out a combo are now Breakable and Counter Breakable. [*] Sweeps are now breakable and counter breakable. Forced quick-rise will occur if your opponent uses a counter breaker, leaving them punishable as expected. [*] Corrected an issue preventing you from ever being Timing-Locked-Out while in the air. [*] Most juggle moves add much less KV than before, opening up new juggle paths to much of the cast. [*] The KV penalty has been removed from Ground Bounce for increased juggle opportunities. [*] Unified Shadow Counter startup time across the entire cast. They start up in 8 frames now, making everyone’s better except Aganos’, which got 1 frame worse. [*] Increased the window during which a Shadow Counter can catch an incoming attack by 7 frames, and also added 10 additional frames of recovery on whiff. [*] Grounded Heavy Normal attacks now ignore Armor. [*] Increased the cancel windows from Linkers into Auto Doubles across all characters to match Jago and S2 standard, so that if you are too early for a manual, you get an auto double instead of nothing. [*] Normalized the frame advantage and buffer check on all characters after auto doubles. Light Doubles leave you +2, Medium Doubles leave you +3, and Heavy Doubles leave you +5. A 5 frame buffer window is on all characters, rather than just some, so that your next move is easier to time. [*] Normalized pre-jump frames to 4 across the cast. [*] LK+MP is now available as an alternate input for Shadow Counter activation, Counter Breaker activation, and Medium Combo Breakers. [*] LK+HP is now available as an alternate input for Instinct Activation and Heavy Combo Breakers. [*] Throw breaking no longer causes 3 fully vulnerable frames on your opponent, and instead causes 3 projectile invulnerable frames. [*] Unlisted Character Changes – Many, many bugs have been fixed that are unlisted, but these do not effect game balance. They only get rid of odd, unwanted behavior. If a bug fix effected balance, for the most part, it is on this list. [+] Adjusted the crouching HK attack box so it better matches his foot. This makes it slightly easier to juggle with as well. [+] Throw canceled into a Shadow Move starts with less KV for increased juggle opportunities. [+] Normal attacks push the opponent back less in a juggle for increased juggle opportunities. [+] Medium and Heavy Laser Sword juggles launch higher and closer for increased juggle opportunities. [+] Light Laser Sword and Jumping LP now cause Flip Out. [+] Shadow Endokuken is larger and has a larger hitbox. [+] New ability: Endokuken Charge! Can now hold the button to delay an Endokuken’s release. [+] Standing HK causes Stagger. [+] The final hit of Ragged Edge and Shadow Ragged Edge now causes a ground bounce against airborne opponents for increased juggle opportunities. [+] Crouching LK causes Flip Out. [+] MK and HK versions of Run move faster. [+] Hamstring’s slide travels farther. [+] New command move: Diving Slash! During Jump Up or Jump Forward, F+MK. [+] Fixed a bug that prevented Shadow Hail from being used after ranged Shatter Linkers or ranged Auto Doubles. [+] Shatter is active for 2 frames longer, making it easier to tripguard with. Its total active time is now 4 frames. [+] Glacius can now dash! It is not good, but hey, you asked for it! [+] Liquidize can now cross under opponents in the corner. [+] Hail can survive off-camera for longer, which prevents hail left off screen from being destroyed, and opens up new setups and approaches when leaving hail behind Glacius. [+] New ability: Multi-Hail! Tap or Hold a different punch button while summoning hail to summon another hail. [+] New ability: Instinct Power Up! New abilities available during Instinct! [+] Light Sammamish now has full body invulnerability on startup instead of just upper body. [+] Call of Sky has 10 frame shorter recovery, adds “Murder of Crows” buff to Thunder 1 frame earlier, and can destroy incoming projectiles from frames 14 to 20. [+] Thunder can now cancel a hit or blocked Skyfall into Murder of Crows enhanced dash. [+] Fixed a bug preventing the duration of the Call of Sky buff from refreshing if you used Call of Sky again while the buff was still on. [+] Juggle properties of some moves adjusted for increased juggle opportunities. [+] Standing Light Kick causes Flip Out, and the hitbox has been improved to assist with juggling. [+] Reduced pushback of juggle normals to increase juggle potential. [+] Can now jump cancel Special Moves during Instinct on block. Previously this was only allowed on hit. [+] Flick Flack Ender now causes a hard knockdown if you don’t juggle off of it. [+] Shadow Knee Slide is now -2 on block (was -6). [+] Air throw deals less KV for enhanced juggle opportunities. [+] When hitting an airborne opponent, Crouching HP re-launches and can be jump cancelled for increased juggle opportunities. [+] New air target combos for increased juggle opportunities. [+] The final hit of Flick Flack and Shadow Flick Flack will now ground bounce an airborne opponent for increased juggle opportunities. [+] The final hit of Medium Ichi Ni San 3rd with now ground bounce an airborne opponent for increased juggle opportunities. [+] Some normal attack hitboxes improved to help when juggling opponents. [+] Standing Far HK knocks opponents vertically instead of away in a juggle. [+] Air Throw starts up 2 frames earlier and is active 2 frames longer. Attack box size increased making it easier to do in combos and more powerful in neutral. [+] New Ability: Buster Slide! Orchid can now cancel the active frames of Knee Slide into a Knee Buster if the move has not hit yet. [+] New Ability: Ichi Nise! Orchid can now Dash Cancel forward while charging up Heavy Ichi Ni San 3rd. [+] Shadow Searing Skull doesn’t knockdown, so you can use it mid combo and manual afterward. This allows you to capitalize more on the Instinct Curse’s new function. [+] Jumping MK (Divekick) inflicts 3 additional frames of blockstun, making it safe if you can get it to hit just before Spinal touches the ground. [+] Attack box on Blade Charge and Shadow Blade Charge reaches lower, making harder for opponents to low-profile this move. [+] Standing HK now causes a Wall Splat. [+] Air Shadow Laser now causes a Hard Knockdown so that it is never punishable on hit. [+] Levels 1, 2, and 3 of the Eye Beam ender launch higher. [+] Overhead causes a ground bounce against airborne opponents. [+] New Target Combo! Crouching HK -> Crouching HP. Launches opponents for a juggle. [+] Shoot Toss KV reduced by 50% for increased Juggle and Combo opportunities. [+] Shadow Vortex is now fully invulnerable until it becomes active. [+] Frame advantage on normals improved where possible to make him less negative if he doesn’t cancel, while still allowing a Shoot Toss to grab the opponent if they don’t jump. [+] Standing LK and Jumping LK cause Flipout. [+] New Air Target Combo: Jumping LP into LK, which causes Flipout. [+] Standing HP and Close Standing HP cause Stagger and leaves you plus enough to manual a Light or close Medium. [+] New Target Combos: TJ Combinations! [+] The 2nd hit from Daggers (Dagger Spirit) cannot cause a combo to blowout. [+] All Linker damage increased to normal damage-and-scaling levels so that Maya gains Ender levels normally. [+] The 2 hits of opener Tumble Kick advance the damage scaling by 1 hit instead of 2, helping Maya build Ender levels normally. [+] Widened cancel window on 2nd hit of Crouching MP target combo and Crouching HP to make these feel better. [+] Tumble Kick and Shadow Tumble Kick cause a Ground Bounce on the final hit against airborne opponents for increased juggle opportunities. [+] Normal and Dagger juggle properties have been adjusted to extend juggle opportunities. [+] Normal and Axe Kick Recapture hitbox sizes improved to enhance juggle opportunities. [+] Adjusted launch velocity on Shadow Leap Kick to make the Dagger Toss followup work as intended. [+] Mantis can cash out combos if a breakable window occurred. It deals more damage than before in a combo. [+] Far crouching HP launches airborne opponents up higher. [+] DF+LK and DF+MK Scorpion Strike attacks now properly count as projectiles, making them unbreakable. [+] Crouching LP and Jumping LP cause Flipout. [+] Juggle versions of Clutch (that used to cause 1 juggle hit but were pretty useless) now cause Flipout and recover much faster. [+] Standing HK and Back+HP cause stagger and are extremely plus on hit, allowing for new opening, setup, and combo opportunities. [+] Tornado projectile always launches opponents toward Kan-Ra, and now does a little damage. It launches higher for a juggle opportunity. [+] New Ability: Monsoon! Hold the button when using Whirl over a Sand Trap to keep spinning and release a larger, more damaging Tornado projectile, which is unblockable at maximum charge. [+] Move re-tuned: Shadow Spike! Shadow Spike now releases a single, multi hit spike under your opponent instead of a series of Spikes. It then leaves an enhanced Shadow Sand Trap that attacks automatically with Scorpion Strikes every few seconds if an enemy is nearby. [+] Reduced KV on Run Back HK and improved its launch trajectory to expand juggle opportunities. [+] Run Back HP Flame Wall deals ~80% more damage. [+] The running portion of Shadow Shoulder Charge now has 1 hit of armor. [+] Jumping HK doesn’t bounce people away from you anymore, keeping them close enough for a followup attack. [+] Crouching HK on juggle doesn’t push opponent away as far. [+] Crouching HK is -5 on block instead of -15. [+] Fixed a bug preventing you from using Primal Linkers after manual normals. [+] Primal Linkers deal ~40% more damage to encourage using them in all levels of play. [+] Predator Mode dashes are now projectile invulnerable on her top half as intended. It should be much easier to Predator dash under projectiles now. [+] Run HK causes stagger instead of a knockdown. [+] Predator Dash HP (Flame Arc) causes stagger. [+] Standing LK causes Flipout, and has a slightly taller hitbox to assist with juggling. [+] New Move: Flame Mortar! – Press and hold 3P to launch Flame Balls in a high arc at the opponent’s location, up to 3 in a series. [+] Rashakuken’s random fireballs deal 4 additional frames of hitstun. Blockstun is unchanged. [+] Shadow Rashakuken and Shadow Orda Shield are no longer destroyed if Omen takes a hit. [+] Doubled the duration of Shadow Meter Lockout. [+] Enders can now build meter even if a Shadow Rashakuken or Shadow Orda Shield is active. [+] Jumping LP, Standing LK, and Standing Close LK all cause Flipout. [+] Demonic Despair is now invulnerable from startup until the grab. [+] Omen can cancel air dashes into attacks much earlier. [+] New ability: Turbulence! Omen can cancel air dashes into the opposite air dash direction by pressing Back or Forward a single time. [+] Adjusted launch velocity on the held part of Shadow Natural Disaster and fixed an issue where the Counter Hit version didn’t match to make juggle timing more consistent. [+] Shadow Ruin startup now has 7 frames of strike invulnerability. [+] Close Standing MP has a slightly wider cancel window for feel. [+] Standing Far HP causes Stagger and is -5 on block (used to be -10). [+] Hitstop on LK, MP, and HP Auto Doubles have been reduced slightly to match the reaction speeds needed to break the matching-strength Doubles better. [+] It is no longer possible to shove Aganos’ body across the stage between rounds. [+] Chunk Up recovers 6 frames faster. [+] Wall Summon moves get the wall out 6 frames faster and recover 5 frames faster. [+] Aganos can rip a Peacemaker out of the wall behind him in 34 frames now (down from 53). [+] Aganos will keep his Peacemaker while being hit, but it will still crumble if he is knocked down, put into a juggle state, or blown out. [+] Thrown Peacemaker causes Stagger on hit. [+] New ability: Recycling! If Aganos tries to Chunk Up while holding a Peacemaker, he will shove the Peacemaker into his chest instead of pulling a fresh chunk from the floor, giving him a drastically shorter Chunk Up animation (Only 39 frames, compared to 69 frames on the original version). [+] New ability: More Recycling! Placing a wall with a Peacemaker in your hand turns the Peacemaker into a wall, instead of consuming a chunk. [+] Improved the hitbox of Hvy Air ORZ so it hits higher up and crosses up easier, making it worth the extra startup. [+] Wrath regeneration speed is increased by 50%. [+] Close HP, Far HK, and Close HK all cause Stagger on counterhit and deal much more hitstun. [+] Standing LP and Jumping LP cause Flipout. [+] You can now jump cancel the 3rd Heavy ORZ if you hit an airborne opponent, and using 2nd Heavy ORZ to juggle into the 3rd hit is easier. [+] Descent is no longer effected by Kan-Ra’s Curse. [+] Descent crushes highs 1 frame sooner and gets underground 10 frames sooner. [+] Hisako used to be able to cancel out of Descent on frame 48 into attacks only. Now she can cancel into movement as well, and on frame 42 instead. [+] New Shadow Move: Air Shadow On Ryo Zan! Hisako can perform a Shadow version of Air ORZ! This version hits rapidly and always recaptures air opponents, and staggers grounded opponents. [+] New Ability: Descent Cancel! Hisako can now cancel into Descent in any situation she could Wrath cancel for a Vengeance counter. This costs half Wrath just like the Vengeance cancel does. [+] Ground Medium Trailblazer inflicts 2 additional frames of blockstun. [+] Cinder can now throw Air Pyrobombs even after doing Air Trailblazer, leading to new juggles and setups. [+] Move re-imagined: Angled Inferno! Different Inferno strengths now attack at different angles. Light is up-forward, Medium is horizontal, and Heavy is down-forward. [+] New ability: Throw Cancel Burnout! While Fired Up, you can cancel your throw into a Level 1 Burnout with QCB+P or QCB+K. This spends your Fired Up state. [+] Shadow Dissonance launches and causes a hard knockdown. It is possible to juggle after this move now. [+] Crescendo causes stagger (grounded Med and Hvy versions still launch). [+] Standing LK and Jumping LP cause Flipout. [+] Heavy Kick and Bombs deal less KV for increased juggle opportunities. [+] Heavy Kick Bombs don’t push opponents as far away on hit for increased juggle opportunities. [+] Juggle values on normal attacks adjusted for increased juggle opportunities. [+] Improvements to the attack boxes on Standing HK, Close Standing HK, and Crouching HK. [+] New Target Strings: Operatic Destruction! [+] New ability: Charge Up Bombs! Can now hold far standing HK to charge up the attack and release additional grenades. [+] Shadow Divekick is now throw invulnerable on startup.